Explores the far-reaching influence of the Apocalypse on society and culture. Shows the book's impact on the Christian church through the ages. Looks at interpretations of the Apocalypse by theologians, ranging from Augustine to late twentieth century liberation theologians. Considers the book's effects on writers, artists, musicians, political figures, visionaries, and others, including Dante, Hildegard of Bingen, Milton, Newton, the English Civil war radicals, Turner, Blake, Handel, and Franz Schmidt. Provides access to material not readily available elsewhere. Will appeal to students and scholars across a wide range of disciplines, as well as to general readers. Judith Kovacs is Assistant Professor of Religious Studies at the University of Virginia. She is the author of a forthcoming book on the church fathers’ interpretation of 1 Corinthians. Christopher Rowland is Dean Ireland's Professor of Exegesis of Holy Scripture at the University of Oxford and a Fellow of Queen's College, Oxford. His previous publications include The Open Heaven (1982), The Book of Revelation (1998), Christian Origins (revised edition, 2002) and Radical Christian Writings: A Reader (Blackwell, 2002). Introduction: The Apocalypse in History: The Place of the Book of Revelation in Christian Theology and Life. 1. The Apocalypse in the Context of Jewish and Early Christian Literature. 2. Differing Patterns in the Reception of the Apocalypse: A Summary. 3. Point of View: Distinctive Emphases of this Commentary. 4. The Reception of the Apocalypse: Survey of Important Interpretations and of Artistic Representations. A Hermeneutical Postscript: Evaluating the Readings. Old Testament References Listed in the Margin of Nestle-Aland 26th Edition of the Greek New Testament Text of Revelation. A ground-breaking commentary on The Revelation to John (the Apocalypse), with a special focus on reception history. 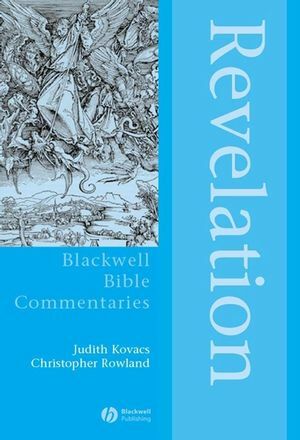 More information about this series is available from the Blackwell Bible Commentaries website at http://www.bbibcomm.net/.